Explosions! Action! Characters! Story! James Spader! I wasn’t really sure how to jump into reviewing a movie like this so I figured I’d start in a similar fashion that the movie started… minus James Spader. And for the sake of spoiling, I will keep the spoilers to a minimum. Instead, I want to focus on the things I was looking for to be answered in this film after I give a brief summary of what adventures the Avengers get themselves into this installment. One thing to note, and it was actually a question my dad asked me before I went to go see it: Does Avengers connect to Age of Ultron like an actual sequel? The answer is yes. So that means if you are one of the 12 people that still hasn’t seen the first Avengers movie, you’d be doing yourself a disservice of not familiarizing yourself with that film first. There are things, particularly an important plot device that remains to be an even more important plot device. But even if you’ve seen it, it’s a good idea to refresh yourself. Plus, it’s grade A film. On a related note: Are the Phase 2 films connected to Age of Ultron? Not really. I mean they are, but in minor roles that may or may not fall into spoilery territory. And just to refresh you all on what the Phase 2 films are: Iron Man 3, Thor: The Dark World, Captain America: Winter Soilder and Guardians of the Galaxy. I’ll also make a note here that compared to the Phase 1 movies, I’ve only seen the Phase 2 movies once, and that was on their opening nights. So do you need to see those films before you see Age of Ultron? Probably not, but you should as it picks up where the first Avengers left off for each of the characters and they contain little nuggets for the long run. The story starts out in a wintry Russian area (sorry for the lack of specific named places) where our lovable Avengers team is attacking a Hydra base. There are lots of explosions and team cooperation, I mean c’mon… one thing that can’t be denied with films like these are the action sequences. If you wanted more, you get a lot more. For the sake of word count, the mission is a success and the base is taken. However Hydra had some secret weapons in the form of two super powered people that fans know as Quicksilver and Scarlet Witch. They don’t play nice, especially the Scarlet Witch who has the power to make you see whatever she wants you to see… and in this case, it’s the thing you fear most, for sake of argument. She gets to most of the team and the dreams she gives them influences them more then they realize. Meanwhile, Tony Stark finds some technology at the Hydra base that he seeks to understand and later wants to implement into his latest endevour “Ultron” with the help of Dr. Banner. He unwittingly releases the sentient A.I. that is smarter, stronger and in his eyes superior than the human race. So with the help of Marvel’s “Wonder Twins” Ultron begins to build his empire, and it’s up to the Avengers to get back to their senses so they can stop him. This leads to our cast trekking all over the world, destroying many roads and building in the process, but with excellent fight sequences and plenty of shine for all the team members to share. Seriously, Marvel movies have great action sequences. It’s more than things that go boom. Let’s take a moment to discuss Ultron as he’s in the title and truly is the main villain. 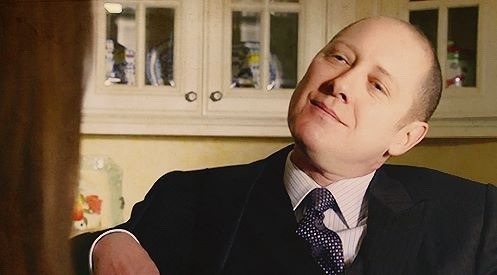 James Spader played him perfectly. I know they used motion capture for his performance and it shows. Ultron even gives the patented “Spader head tilt” at one point, or many… along with Spader’s special cadence that just drips with awesome oddness that is Spader. Do any of you watch The Blacklist? Anyway, Ultron is a true villain to be reckoned with, and one that makes you wonder how he can be defeated when he has the power and resources to build so many versions of himself. Oh, and he’s connected to the Internet, obviously. I’d already see this movie again, but I’d see it again just for Spader. The other question early on regards the character of Quicksilver. Due to licensing rights jargon between Fox and Marvel that I don’t care to go into right now, Quicksilver and Scarlet Witch are like the children of divorced parents. Quicksilver appears in both X-Men: Days of Future Past (2014) and Avengers: Age of Ultron (2015) but are played by two different actors with two different backgrounds. In the comic book world, the father of Quicksilver and Scarlet Witch is Magneto. It’s hinted at in the X-Men movie, and in Avengers their parents are completely killed off. I’m refusing to do research right now on this particular subject but I think this was settled in court, which is one time I wish I had jury duty. What’s the difference between 2014 Quicksilver and 2015 Quicksilver? Screen time. Also background history and personality. Evan Peters in 2014 had probably the best scene in the movie. Unfortunately, he was only in the film for a brief but effective time. Arguably that film was another ensemble piece where everyone fights to get a moment to shine but that’s where Avengers excels. Aaron Taylor-Johnson gets room to really stretch his legs all throughout the film. So really, the only similarity these two Quicksilvers have is name and special ability to run fast. Who played it better? I’ll say this much: Peters stole the film with his one scene. Taylor-Johnson got to watch evolve as a character. IMAX? 3D? 2D? How should I spend my money? It’s not imperative to see this in 3D like Avatar which is still my 3D standard… but it’s not bad. Nothing at all like Clash of the Titans. That’s my low bar. Or the bottom. If a movie is in IMAX, I say go for it almost every time. I still don’t know why Will Smith’s Focus was in IMAX but that’s a study for another day. But this is a cram-your-mouth-with-popcorn kinda movie, or fruit snacks in my case, so go for all the bells and whistles. Once again, this is what summer movies are all about. Bring the kids, because they probably already want to go. Last note: Is this better than the first Avengers? That’s a tough call to make, and there are few in my opinion that are. But if Larry Wilmore were asking me, I’d have to keep it 100 and say it’s not better, but it’s not worse either. It’s different and more of the same that I enjoyed from the first one. I’d need to watch it about 10 more times so I can compare it probably to the first Avengers films, since I’ve seen it just about as many times. And I’m okay with.